This addon adds drop down menus as an alternative way to select type, material (level), style and trait. Just left-click on the labels "Type", "Material", "Style" or "Trait". The ones, whose color will change, if you hover them. As an additional benefit the styles are sorted alphabetically. Came here looking for a solution to why I didn't have the drop down or something to click on. I guess you can't add a downward pointing triangle after each Label? Or in the label? This, like every other Votan addon I see, is so common sense. Thanks for them all and the speedy API bumps. Re: Re: Re: Re: Just click on the labels. So, why doesn't it display the dropdown menu that is shown in the screenshot? @Shadowshire Are you using gamepad mode? No, just playing on PC NA and running TESO with the Windowed ( Full Screen) setting. Apparently you have revised the AddOn Info tab to clarify on what to click the Left Mouse Button (?) in the Crafting Station UI. Now that you have identified them, I can display the drop-down menus. That should be very useful, especially for Styles, since most of my four crafting characters have learned more than 40 motifs. As strange as it seems, I don't believe that I ever clicked the LMB on any of those four words, but on the arrowheads < and > and on every other icon and word that is on the UI (!). Of course, I've read those four words countless times during the past 4 years that I've played TESO. I guess that my eyes see them, but the mind does not need them to know what is displayed on each line of the UI. Re: Re: Re: Just click on the labels. Re: Re: Just click on the labels. When I read that, I assume that you mean the names of items listed on the dropdown menu. Please clarify whether to click the Left Mouse Button or the Right Mouse Button -- at least, if there is a difference in the result. Also, please list any libraries which must be loaded in order to use Crafting Quick Access. Regardless, I have not found any way to cause the dropdown menu to be displayed. 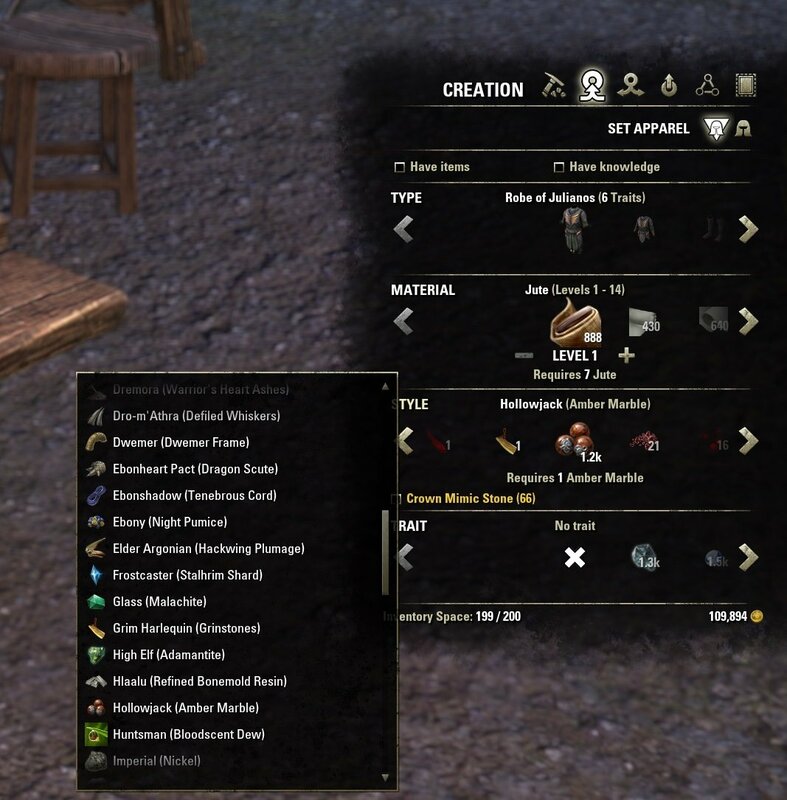 I have clicked the LMB on every element of the Crafting Station UI display, and the RMB on some of them. Nothing happens. 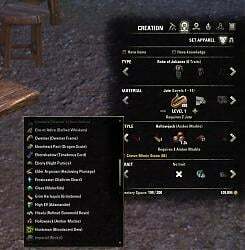 For what it is worth, I unloaded each and every add-on which I know either modifies the Crafting Station UI, or receives any input from, or sends any output to, the Crafting Station UI. The outcome did not change. If there is some other add-on conflict, then it would be very time-consuming to find (especially given the lousy performance of the Bethesda megaserver that has been caused -- according to ZOS -- by changes in the Internet). This addon is so small, it does not need any library. Re: Just click on the labels. Just click on the labels. Last edited by Shadowshire : 12/31/18 at 06:45 PM. Thanks Votan! Love the alphabetic sort!